Author, Nancy Rue, has an incredible trilogy called the Mean Girl Makeover which deals with all 3 sides of bullying; the bully, the victim and the witness. Book 1, So Not Okay is the story of Tori, the witness. Book 2, You Can't Sit With Us, is the story of Ginger who is the victim. And now in book 3, Sorry I'm Not Sorry, we have the story of Kylie, the bully. Kylie has been bullying for some time. She was even forced into counseling. As she continues to bullying, her counselor strives to get to the bottom of why Kylie bullies. If you have a tween or teen, there is a good chance they have faced bullying from one of these standpoints. The Mean Girl Makeover series is a great set of books to teach your children and to open the lines of communications. 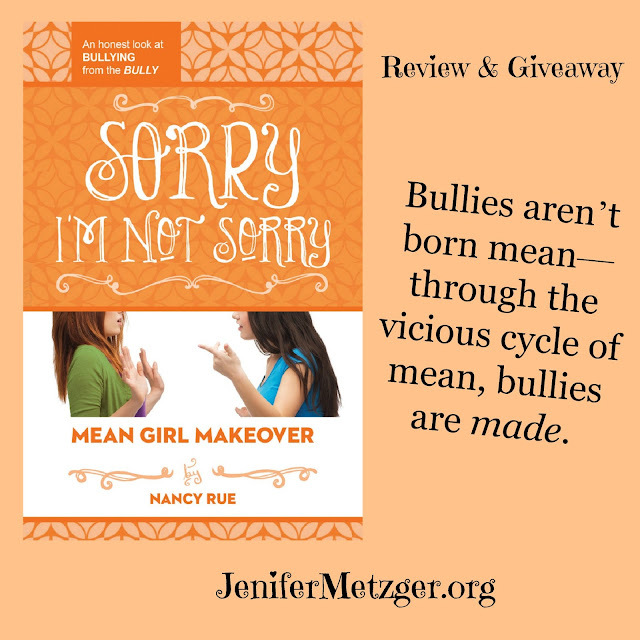 To win a copy of Sorry I'm Not Sorry, complete each task in the rafflecopter below. Thanks for the book review and giveaway Jennifer.